Caramel Apple Salad a simple salad is made with whipped cream, cream cheese, butterscotch pudding, apples, pineapple, peanuts, and toffee bits. Caramel apple salad actually tastes like a caramel apple but is not as messy to eat. It takes a bit of time to chop the apples and peanuts also to whip the whipping cream, but it is well worth all that chopping and whipping.Pudding salads and jello salads have always been a big thing with my family, especially around the holidays. Still, to this day when there is ever a family gathering, you will find at least one salad that contains pudding or jello along with cool whip, fruit, and maybe some marshmallows. It seriously has been a tradition for many years. The kids in the family always load their plates up with these salads, they totally love them. And even the adults enjoy them. How about you do you like these salads or maybe you’re not into these at all? So with this caramel apple salad, I am following the tradition that has been in my family for ages, but with a bit of a twist. There is no cool whip in this recipe. Yeah, I wanted to go with something homemade. The cream cheese and the pudding hold the whipped cream together. I love the salty peanuts with the sweetness of the whipped cream and the pudding. It makes a great fall fruit salad, but don’t worry you can serve it all year long. Your family is going to love it. 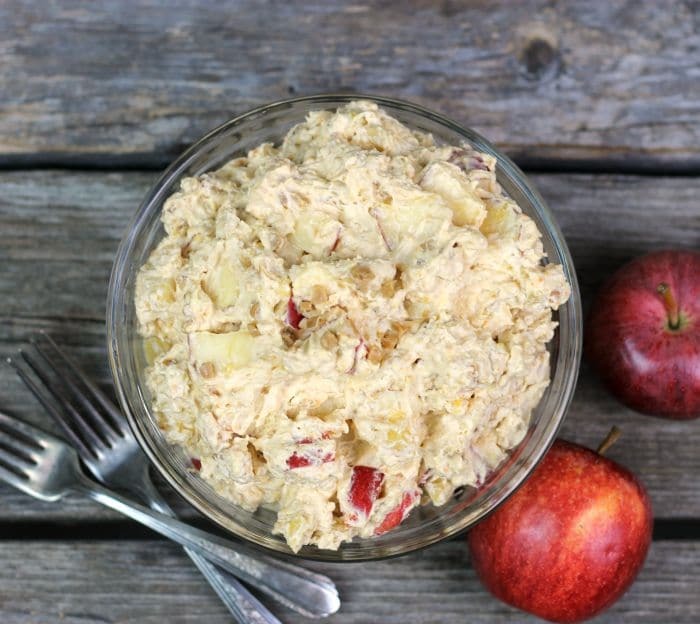 Chop apples into small bite-size pieces. Coarsely chop the peanuts. Set the apples and peanuts aside. Whip the cream until soft peaks form with an electric mixer. Clean the beaters beat the cream cheese until it is creamy. Add the powdered sugar and beat in then add the vanilla and beat in. Add the cream cheese to the whipped cream and beat until stiff peak form. Add the pudding mixture and fold in with a spatula. Fold in the pineapple and the apples. Add the peanuts and toffee chips fold in until well blended. Refrigerate until chilled. 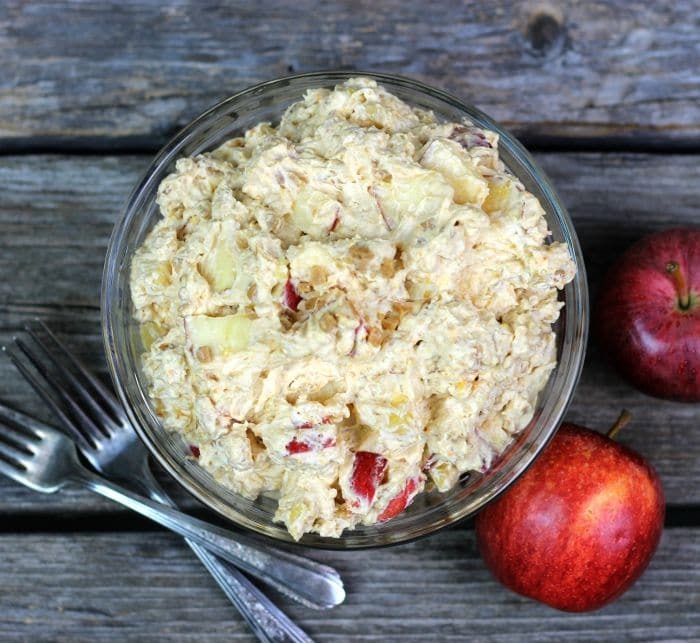 Have never made a sweet salad…this is a perfect Fall dessert! This certainly puts the decadent in Apples! Sounds much easier to eat than a caramel apple on a stick. I had how the caramel gets stuck in my teeth, but that isn’t a problem in this salad!